Green bean casserole is a staple side dish for Thanksgiving celebrations. However, traditional versions use canned cream of mushroom soup and are topped with those crispy onions that come in a tin. 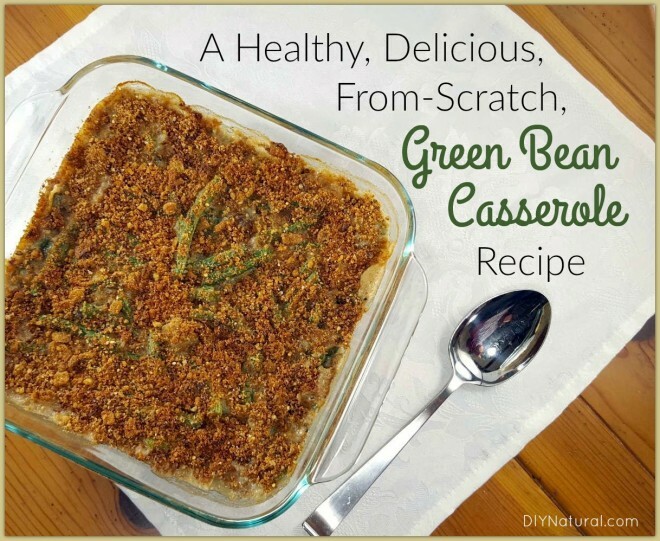 So, what to do when you’re craving the childhood comfort of green bean casserole, but you want it without all the junk? Make your own, of course, from scratch! So, naturally, the first task for homemade green bean casserole is a homemade cream of mushroom soup. While the task may seem daunting, cream of mushroom soup is actually an easy soup to create from scratch. If you’ve ever made gravy or a white sauce for pasta, all you need to do is add mushrooms! Oh crispy onions in a tin. There’s something SO wrong about you. Have you ever tried to make crispy onions? Outside of battered and deep fried, onions don’t naturally become (or stay) that crisp. Trust me. I’ve tried. I’ll admit, even after avoiding them for quite a few years, I still had this built-up impression of them. I didn’t eat them because I knew there was something not right about “onions” that would stay that crisp. But, it was more of an “I shouldn’t” avoidance, not a “I don’t want them.” Until, one holiday after not eating them for years, I was faced with an open tin. And out of curiosity, I tried one. (Don’t hate me. You know you would have too.) What I discovered shouldn’t have been as much of a revelation as it was: THEY TASTE FAKE. Like, nothing remotely onion-y about them. Why people love them, I don’t know, but for me, the temptation was no longer an issue. ONIONS, PALM OIL, ENRICHED FLOUR (WHEAT FLOUR, NIACIN, REDUCED IRON, THIAMIN MONONITRATE, RIBOFLAVIN, FOLIC ACID), SOY FLOUR, SALT, DEXTROSE. The result of our homemade sauce and onion-infused bread crumb topping is a green bean casserole that will rival any memories of the canned and tinned version. Yes, it does take a bit longer to make. But, if needed, it can be prepared ahead of time. And the result is well worth it. Boil 4 cups of water in a large saucepan. Add green beans and blanch for 1-2 minutes, until vibrant in color. Remove the beans and transfer to a bowl of ice water to stop their cooking. Drain beans and place them in an 8×8 baking dish. In a large skillet, heat 1 Tbsp butter over medium high heat. Add ¼ diced onion and sauté over medium heat until soft, 2-3 minutes. Add the bread crumbs and salt. Continue to sauté 1-2 minutes, or until bread crumbs are fragrant and toasted. Transfer breadcrumbs to a paper towel-lined plate and set aside. In the same (now empty) sauté pan, heat 2 Tbsp butter over medium high heat. Add the onions and sauté 1-2 minutes, until soft. Add the mushrooms and continue to sauté 1-2 minutes, until they begin to soften. Reduce the heat to medium low. Add the flour, thyme, ground mustard, and pepper. Cook, stirring constantly, for 1 minute. Add the broth and milk. Bring the mixture to a simmer over medium heat, and simmer 10-12 minutes, until the gravy has thickened. Pour the mushroom gravy over the green beans in the baking dish, and mix to coat. Top the beans with the seasoned bread crumbs. Place the dish in the oven and bake 15-20 minutes, until bubbly to the center. *Need to serve a crowd? This recipe can easily be doubled to fill a 9×13 baking dish. Just add 5-10 minutes on to the baking time. **To prepare the dish ahead of time, store the cooled topping mixture in an air-tight container on the counter. Mix the sauce and blanched green beans in the baking dish. Cover them and store in the refrigerator. Remove the baking dish from the refrigerator a hour or two before you want to cook it, to let it come to room temperature. Bake the green bean mixture, covered for 10-15 minutes. Remove it from the oven and top it with the bread crumbs. Then return it to the oven, uncovered for 15-20 minutes, until bubbly to the center. Great recipe! Could you use Panko bread crumbs? I have a lot of them. Thanks! Hi Debra. Yes! Panko would work great! I’m going to give this a test run before TG…I have everything except the mustard seed in the house. Can I sub mustard powder and if so, how much and can frozen green beans be used instead of fresh? Hi Chris. Yes, you can use mustard powder for the ground mustard seed. Just use the same amount, 1/4 tsp. You can substitute frozen green beans for the fresh without a problem, just make sure they are thawed before using them. Thank you so much for this recipe! I stopped making green bean cassarole because of unhealthy ingredients. We have missed it too! I’m going to make it using dried onions and mushrooms (rehydrated) and it will be another food storage creation. Thanks Brenda! I hope you enjoy it!